Bb clarinet traditional reeds, strength 2.5 or strength 3.0 for option, 10pcs/box. Made of high-quality reeds, which have experienced 2 years of growth, with great flexibility. 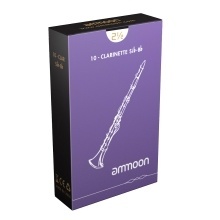 The thinner reed tip with excellent response, allows a pianissimo attack in even highest notes. Each reed has an independent protective casing for effectively protecting the reeds and conveniently carrying the reeds out. Great for all-around use, from eager students to busy professionals, from classical to jazz.